I kind of collect trees. I don’t dig them up or anything like that but I do take pictures of them. These two are my latest acquistion. I can’t tell if they like each other but you can tell they have lived with other a long time. Here is a winter sky from a clearing not far away. I love winters. Yes it is kind of cold but it has its own kind of beauty. We have had a spell of cold weather here in Oklahoma that is uncomfortably long. Ranchers have to go out and break the ice so their livestock can drink water. 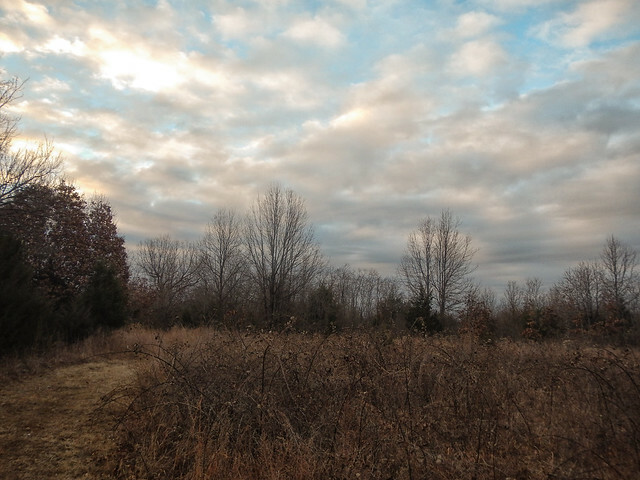 This entry was posted in Skywatch Friday and tagged 3G Ranch, Keystone Ancient Forest, Oklahoma, Sand Springs, Skywatch Friday on January 17, 2018 by Alan Bates. Those trees are dancing! It looks dry in Oklahoma. We sure need more snow here in Breckenridge too. I like especially how the bare tree branches are against the winter sky. Hello, the first image is lovely. I love the trees! Poor cattle have some ice cold water to drink, I wonder if they like water so cold. Happy Thursday, enjoy your day and weekend ahead! Love the artistic edit to the tree and great farm scene with the cattle! We had fun breaking ice in puddles and troughs too! If you have to go out and break the ice for your livestock, you know it’s cold!! Great photos, and I like the shot of the paired tree. The photo of the two trees is stunning. Well done. From your photos it doesn’t look so cold. Did you get any snow or just frigid temperatures? Love the first picture of the pair of trees! I am sure they love each other, they make a good pair! Yogi – that first photo of the trees is a work of art. I think it would look amazing blown up and framed. The colors are beautiful and the trees are really interesting. I bet that water is pretty cold for those cows! I loved all of these photos, but the one with the livestock was my favorite, with the contrast of brown water and ice, and winter colors. 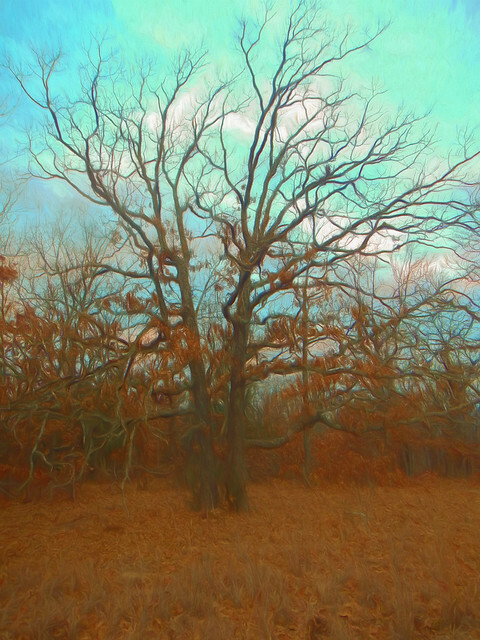 I agree that there is something about trees without their leaves – a character,something that has fascinated me for years. I think winter offers photographic opportunities we don’t see in summer – the ‘skeletons’ of common objects such as trees, and cattle trying to drink from a frozen trough! Lovely images, one and all. Wishing you a warmer week!